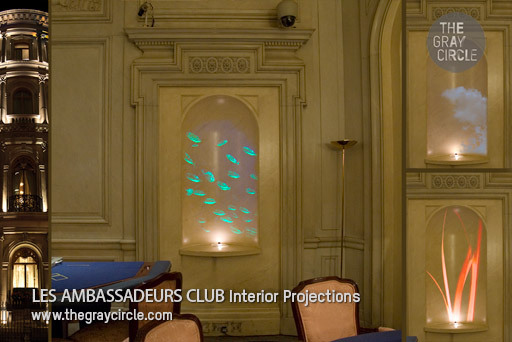 Les Ambassadeurs is a private members’ club located in Mayfair, London. Our client wanted to retain the prestigious feel of the classical interior of this Grade 2 listed building but also to invigorate it with an edgy contemporary feel. Working with Peter Bonnici we came up with the idea of projecting images of nature directly onto paintings and sculptures to bring the interior alive creating a magical experience for the viewer. To further enhance the atmosphere all projectors were hidden making sure it was about the experience, not the technology. Finally, it was decided the projections would only be seen 5 minutes every hour to make the whole experience even more magical as if it was a mirage, appearing and disappearing throughout the day. 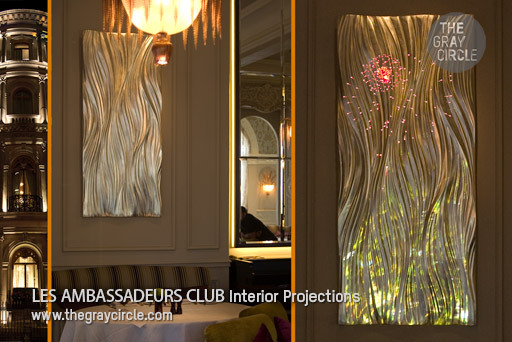 Projecting images onto wall sculptures in the restaurant. In the Marble Room we projected images into alcoves on either side of gaming tables. 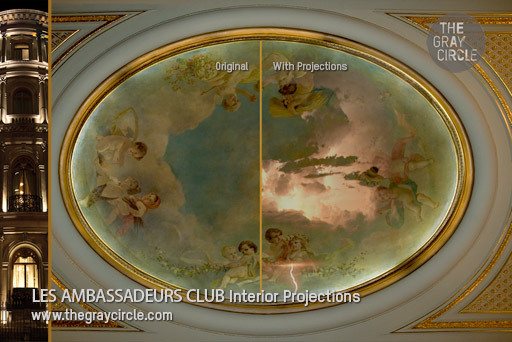 The ceiling painting was transformed by the stormy skies and water projections.